Get high quality air compressors, parts and custom air piping systems at competitive prices. We have a highly skilled and knowledgeable team of staff who can help you will all your compressed air needs. At Mac-Air we provide professional solutions for all your compressed air needs. We are dedicated to service and quality. Our knowledgeable staff can help you achieve your goals. We provide quality parts, competitive sales and exceptional service. Our staff has over 25 years of compressed air experience . This gives us a great advantage in coming up with creative solutions for your compressed air needs. Install new air compressors, pipes, and support equipment. We also remove any obsolete or old equipment. Call us when you face broken rotary screw compressors. Our Brampton office provides 24-hour response to ensure your business runs smoothly regardless of the emergency. Schedule regular maintenance checks for your air compressors. 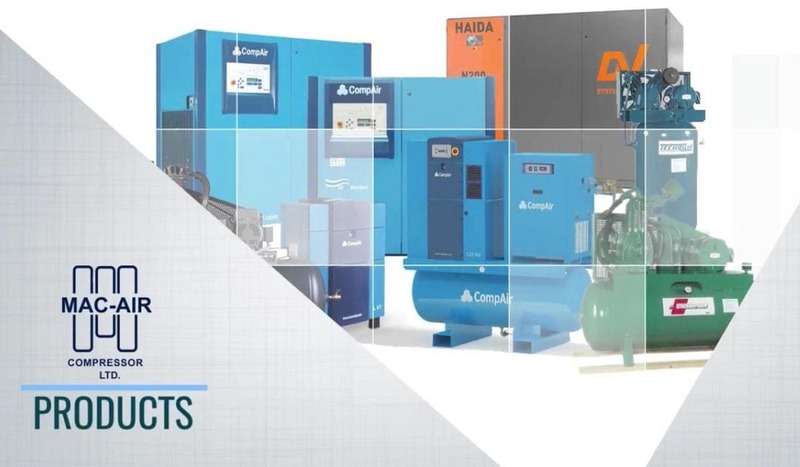 Mac-Air Compressor Ltd has a selection of piston compressors that can fit with various industrial requirements. Rotary screw air compressors improve your establishment's air quality and do not make too much noise. If you're looking for reliable and cost effective compressors, a hydrovane air compressor is the perfect choice. We have a variety of gas compressors suitable for any mobile truck applications. Choose from our wide range of quality OEM and genuine after-market air compressor parts and accessories. Have a specific question about a compressor, part or service? Fill out the form below and a representative will get back to you shortly. Copyright 2019. All Right Reserved. Powered by: Local SEO Search Inc.